Last week I stayed at The Peninsula Tokyo, and what a luxurious treat it was. The vibe of the Peninsula hotel Tokyo is simply stunning. Located in a leafy part of one of the most luxurious shopping districts in the world, Ginza filled with tree lined streets, the lobby of The Peninsula Tokyo has soaring ceilings and stunning artworks. The 314 rooms and suites are spread across 24 floors and are spacious with huge windows, and staff are plentiful. All this in Tokyo, a city crammed with people, and few open spaces. The rooms at The Peninsula Tokyo are carefully designed to feel spacious and open with lots of natural light. But none of the above was the highlight. After I checked out of the property, I left the hotel for the train station, a hectic drive and locating the platform for my shinkansen bullet train to Osaka was even tougher – there is almost no English signage in Tokyo at all, even in stations, and few people can speak it. That was a shock. It was 36 degrees, humid, and I had way too much luggage. Renae Leith-Manos with the staff at The Peninsula Tokyo, where the service is outstanding. Right before the train pulled up, I spotted one of the well dressed staff from The Peninsula on my platform. He rushed towards me with a beautifully wrapped brown paper bag as the reception staff had remembered after my departure that I had mentioned how much my son (at home in Australia) loves Peninsula chocolates, and I had left them in my room by accident. They hand delivered them to ensure I had them to take to Sydney – wow. I have heard of these kind of stories before, but have never experienced that level of service first hand. Having stayed in three Peninsula properties now, the formula is becoming pleasantly transparent. Staff who work at this luxury hotel group are focussed on knowing & remembering guest’s names, and slowing down enough to make time & real connection.They really do help their guests. Attention to detail is paramount and evident in everything they do. From Italian espresso machines in every room, a private valet box where everything from newspapers to confirmation letters are delivered, to Peninsula brand juices, and chocolate truffles before bed, this hotel defines luxury. The lobby of the Peninsula Hotel Tokyo. Tokyo is a vibrant, bustling, busy city – where little English is spoken. The concierge -all of whom are fluent – are worth the room rate alone, and they can organise just about everything you need. The concierge were simply amazing. If it wasn’t for them, taking the time to ask what kinds of experiences I enjoy and what I wanted to see, I wouldn’t have seen Tokyo in the way that I did and had such incredible experiences. Buying a band aid (or anything else) in Tokyo is near impossible without the concierge writing down the name & directions to a pharmacy & the words (symbols) in Japanese. Peter Bar at The Peninsula Hotel Tokyo. Like a stay in New York or Milan, the two cities that most remind me of Tokyo, kicking back at the hotel is a daily essential due to the sheer pace and number of people outside. The huge spaces are a welcome relief from the crammed subways and restaurants at times. Renae Leith-Manos at The Peninsula, Tokyo in August 2017. 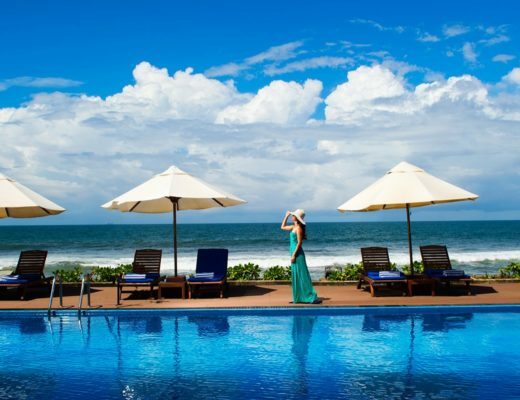 The pool – like all Peninsula Hotels is indulgent, and well designed. It includes a feature wall fountain, ceiling light display and staff on hand to assist. The fitness centre is spacious & well equipped, but my favourite feature of the hotel was the cocktail bar, simple called Peter. The huge walk in robe in the spacious rooms at The Peninsula Hotel Tokyo. Like the Peninsula’s flagship property, the Hong Kong Peninsula, where the world famous bar Felix is at the top of the hotel, Peter is accessed via a separate elevator, and is also at the top of the hotel, and has sweeping views over the city, as well as some of the best cocktails you will find anywhere in Tokyo. An upmarket restaurant sits alongside. Renae Leith-Manos at The Peninsula Tokyo’s rooftop bar, Peter. This bar is all about the staff, who are friendly, chatty and know how to mix a serious drink. I could write about the sumptuous breakfasts, and even the well dressed, warm guests I met around the hotel, but you have to go this incredible property to experience it all. There is even helicopter pick up service available. Brilliant.